Falling For YA: Stalking Jack the Ripper Giveaway! 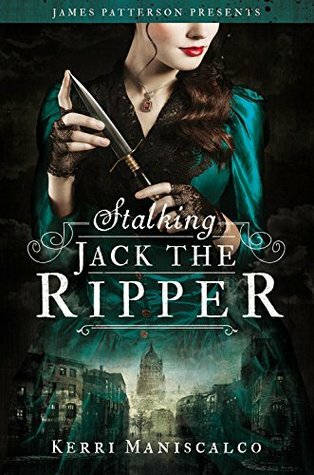 Stalking Jack the Ripper Giveaway! Did you know James Patterson has launched his own imprint!? I didn't either! So you can imagine how excited I was when I got an email about Stalking Jack the Ripper, the first title in the new imprint. To celebrate this new imprint I'm giving away a copy of Stalking Jack the Ripper! I am VERY excited about this book! I have read a few of Patterson's Women's Murder Club series, but I don't think I've read any Jack the Ripper stories. Thanks for the giveaway! I am BEYOND excited to read this book! I am so glad you posted about it, otherwise I don't think I would have stumbled across it on my own. And Forensic Science is literally my jam! I actually have a MS degree in Forensic Science. So I basically think Kerri & me should be best friends, haha! I haven't read any of Patterson's book but I've always loved reading about serial killers and Jack the Ripper is considered one of the most infamous so yes, I'm definitely excited about getting my hands on this book! I loved Suzanne's Diary for Nicholas. I am a major Patterson fan and have read all his series. I am looking forward to this book and appreciate you bringing my attention to it. I am very excited to read this book; I have not read anything by Patterson. I am very excited about the book. I haven't read any of Patterson's books or anything about Jack the Ripper, but I want to. I haven't read any Patterson books, and it's been a while since I read anything with Jack the Ripper in it. This book looks really creepy good! I haven't read any books by Patterson but I've seen movies and documentaries about Jack the Ripper. I would love to read a fresh take on the Jack the Ripper subject.